Ryan has succeeded in becoming a valuable Broker in the Northwest commercial real estate industry and First Western Properties through his determination and dedication. 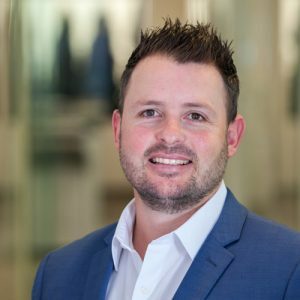 Growing up in South Africa, Ryan completed a degree in marketing management along with continued education in sales. After much travel around the world, Ryan settled in the United States where he pursued the yachting industry and graduated to Captain. Since his career transitioned from a private yacht captain for many high-profile clients all over the world, Ryan has quickly acquired a firm handle on the business. With a strong application of experience in business and personal management skills in the field of commercial realty, Ryan utilizes a strong organizational skill set, communication, leadership and interpersonal qualities within a professional, creative and stable environment. He expresses strong leadership with a talent in managing projects, accounts, negotiations and relationship building. Through his time at First Western Properties Ryan holds an impressive resume with a primary focus in tenant representation, landlord representation and land assemblage. His current professional focus includes both National and local representation along with an eye for development opportunities. Ryan is passionate for the outdoors with a keen interest in golf and fly-fishing when not spending time with his wife and 2 kids.